I'm pretty certain that my body is at least 5% peanut butter at any given time. Peanut butter is the holy grail of all foods — it's so smooth and creamy, healthy and satisfying, and is literally good on anything and everything. I eat powdered peanut butter in my greek yogurt in the mornings, with a banana at lunch, and one time I even decided to slather it on a piece of turkey (yeah that was a no). Essentially, peanut butter is my life. 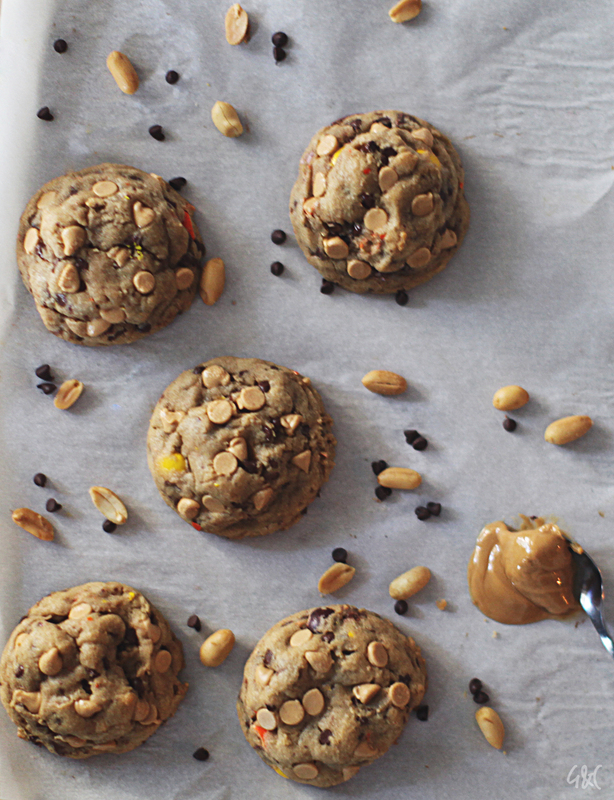 If you're also a peanut butter addict like me, you should make these cookies. These cookies are overflowing with God's greatest gift to humanity. There's peanut butter in the dough itself, peanut butter chips, Reese's pieces, and even crushed up Reese's cups too. Tempted yet? In a bowl, whisk together the flour, baking soda, salt and pudding. Set aside. In a mixer fitted with the paddle attachment, beat butter, peanut butter, and the sugars on until light and fluffy (4 minutes on medium speed). Add in eggs one at a time. Beat in vanilla extract and honey and beat until combined. Reduce the mixer to low speed, add dry ingredients and mix until just combined. Add the chips and candy pieces. Scoop 1/4 cup balls of dough and space the balls 2 inches apart on prepared trays. Bake cookies for 11-13 minutes. Cool on trays and eat until you vomit.